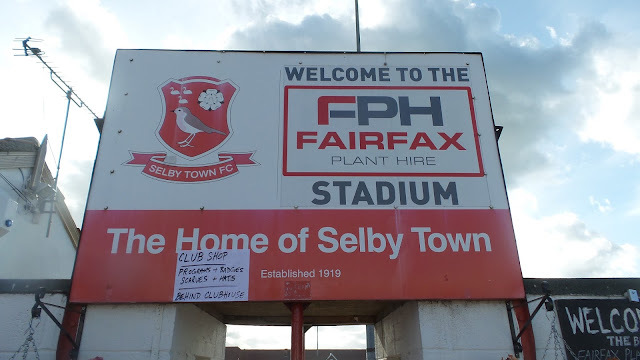 SELBY TOWN were formed in 1919 and immediately joined the Yorkshire League, At the time, it was a singular division and Selby were champions in 1933, 1935 and 1936. 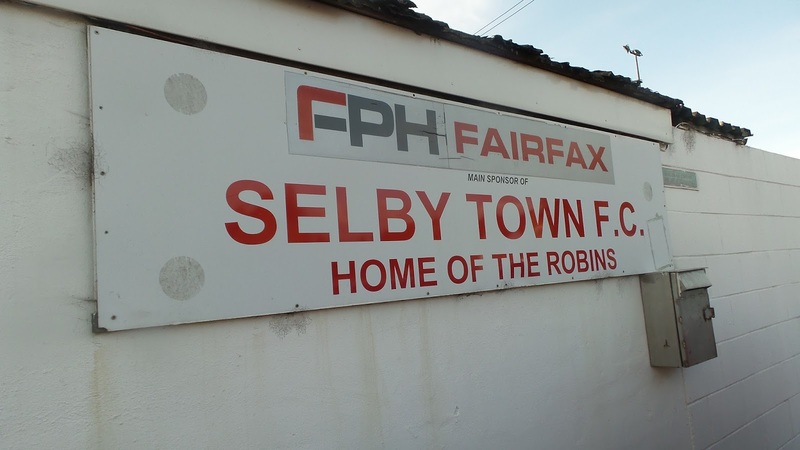 The league would expand to multiple division in 1950, but this didn't stop Selby being crowned champions twice in a row in 1953 and 1954. Tough times were to follow exactly 20 years on from these triumphs, with relegation to Division 2 and then Division 3 in successive seasons. Though they bounced back from the latter immediately, they were relegated back straight away. 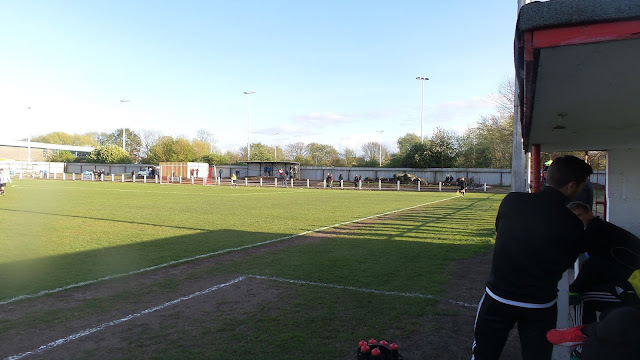 The league was absorbed into the newly-formed Northern Counties East League in 1982 and they would remain in the league's bottom tier until 1996 when they were Division 1 champions. 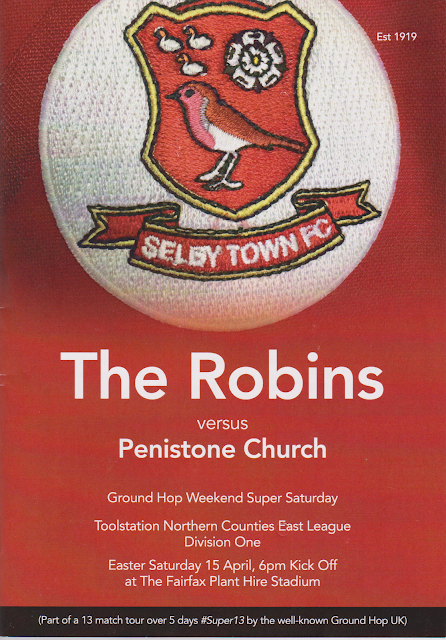 2004/05 would see their best-ever season when they finished 2nd and two points behind champions Goole. 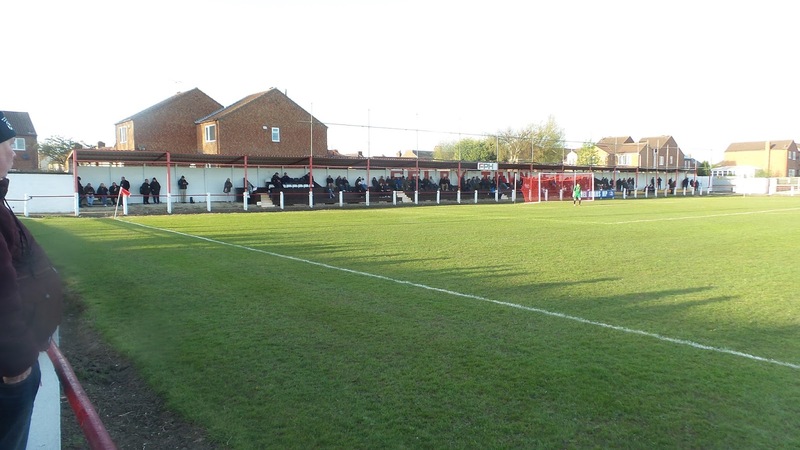 Their run in the NCEL Premier would last until 2012 when they were relegated back to Division 1. It's been mainly bottom-half finishes since, though this season they sit in 11th with a chance of a top-half finish should they continue their good recent form. In the FA Cup, Selby Town's furthest progress came in 1954. They defeated Gainsborough Trinity and Rhyl before a 2-0 home defeat to Hastings United in the second round. 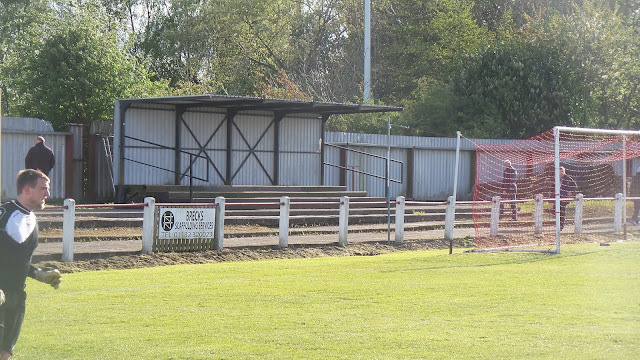 In the 1995/96 season, they reached the FA Vase 4th Round with it taking three games for Trafford to eventually prevail 2-0 in a second replay. 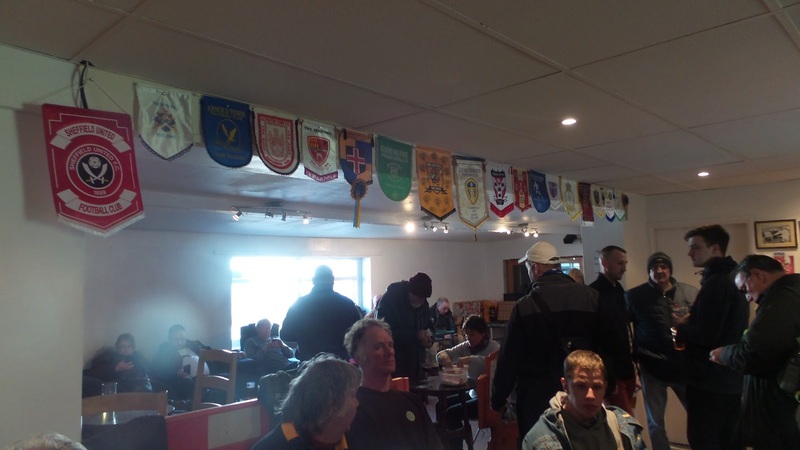 Local honours include the NCEL Presidents Cup, Yorkshire League Cup and various West Riding Cups. After the game at Armthorpe, I left their ground at 3.55, listening to the Nuneaton Town v Harrogate Town game on the radio on my journey across to Selby. It was a decent trip and I was parked up at the ground at 4.30. 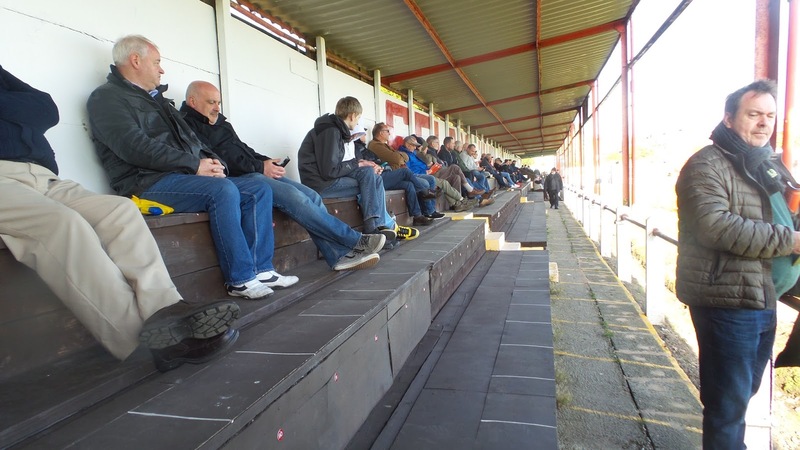 I was glad to have 90 minutes before the game - often on hops, it's all a bit of a rush if you are driving, which is a good reason to consider the coach if you are doing the full set of games and have based yourself near the initial pickup point. 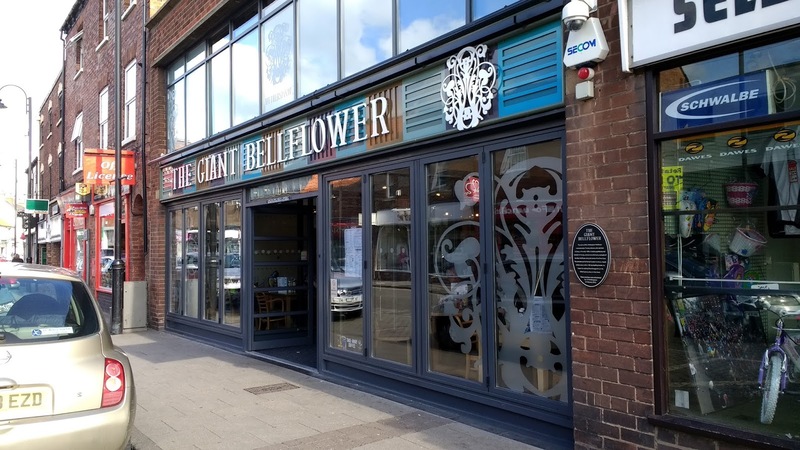 I wanted to tick the local Wetherspoons, The Giant Bellflower, which was 5 minutes walk from the ground. There I was able to relax with a pint of Old Rosie cider, which came in at just over £2 thanks to my CAMRA voucher. I got back to the ground at 5, with still a nice amount of time to have a proper look around. This was the best setup of the clubs on the hop, at least the ones that I went to. As a consequence, I spent the most I did in any ground. 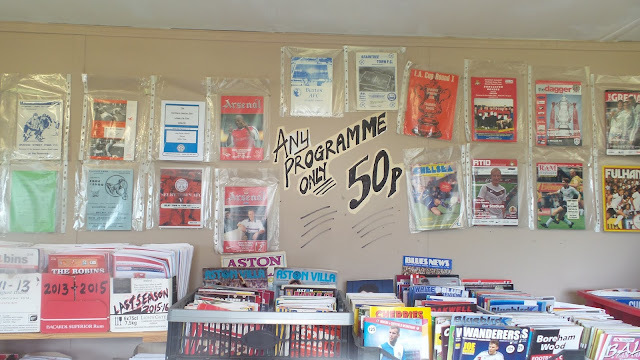 From the club shop, I got 5 old programmes and a pen for £2. 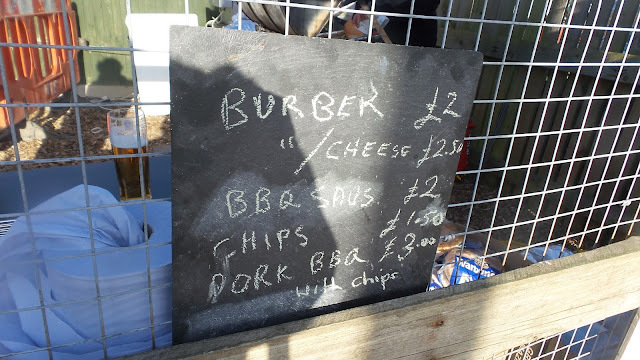 Food options were the most impressive of the hop games I did. 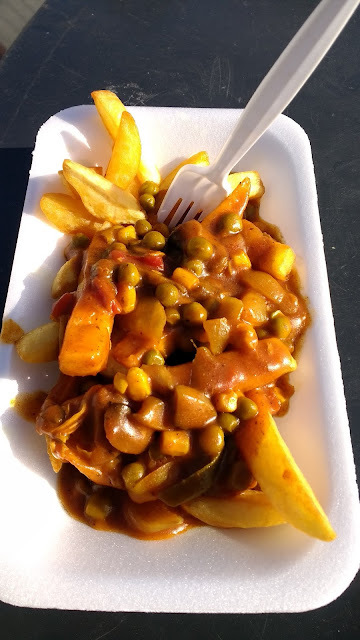 Over the evening I had Curry and Chips, BBQ Pork & Chips and BBQ Hot Dog, all of which were tasty and well priced, and made another £7.50 for the club. The game was a decent contest with the hosts taking the lead on 35 minutes through Dane Mortimer, though I didn't have the best view of the goal as I was up the other end of the pitch. It had been a fairly even first half, but visitors Penistone Church stepped things up after the break, having by far the better of the second period. 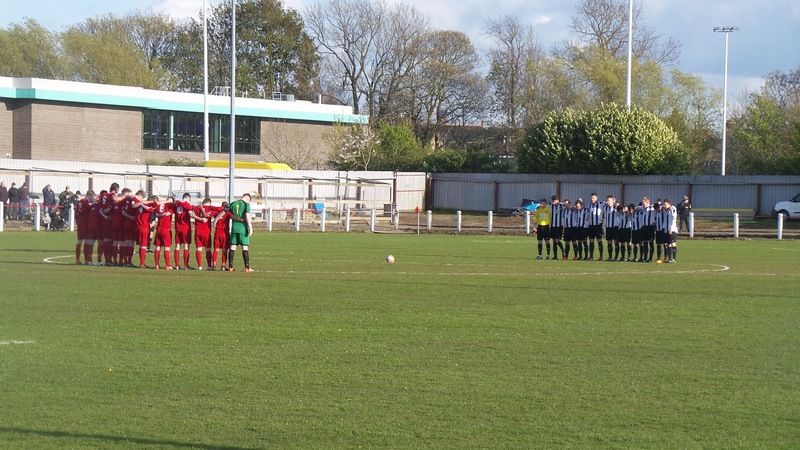 They got their reward on 68 minutes when an initial shot was parried, but Scott Whittington was there to follow up from a few yards. My overall experience of Selby was very good, though there was one drunken moron who didn't represent his club well. He stood on the sidelines abusing his own players all game. A constant unrelenting stream of expletives lasted the full 90 minutes, with every misplaced pass, missed tackle or shot or where the goalkeeper didn't make a heroic save. Not great when you consider that the players would have been giving 100% for not much money at all. His side even came close to winning it in the dying embers of the game, hitting the bar. Overall they would probably be happy with the point, given that the visitors had the better of the game. I left the ground just before 7, getting to my hotel around an hour later. On the way, I passed AFC Emley and also recognised the hotel as the point that I hurriedly searched for fixtures last season as games fell by the wayside. I'd dropped fellow hopper Anwar at Burnley, and had initially chosen Clitheroe as my game. When that was off, I headed for Liversedge, but that too fell victim to the weather whilst I was en route. 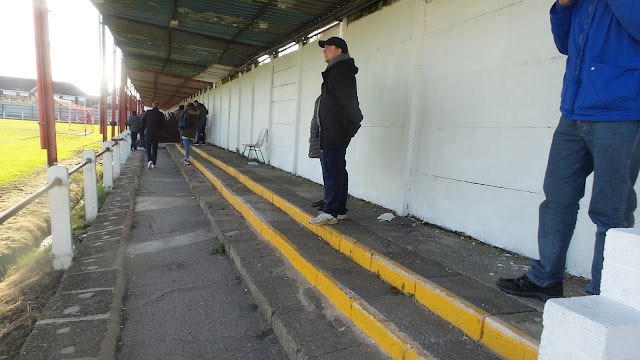 I eventually ended up going to Ossett Albion, which thankfully was on and was an enjoyable day. 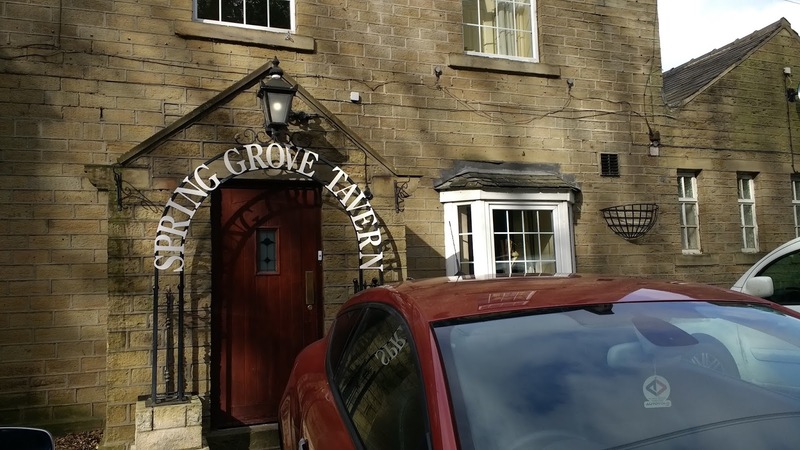 The Spring Grove Taven was very basic, with a tiny room and no TV. At least it was clean though and at only £20 a night, you can't really complain. I know my Norwegian hopping pal Anders found it a convenient stop when he went to nearby Shelley FC. I had a few cans while I typed my blog and listened to TalkSPORT. I was glad of my laptop as it was the only way I could watch Match Of The Day on a big screen. I fell asleep pretty quickly after that, having enjoyed a busy but enjoyable day. 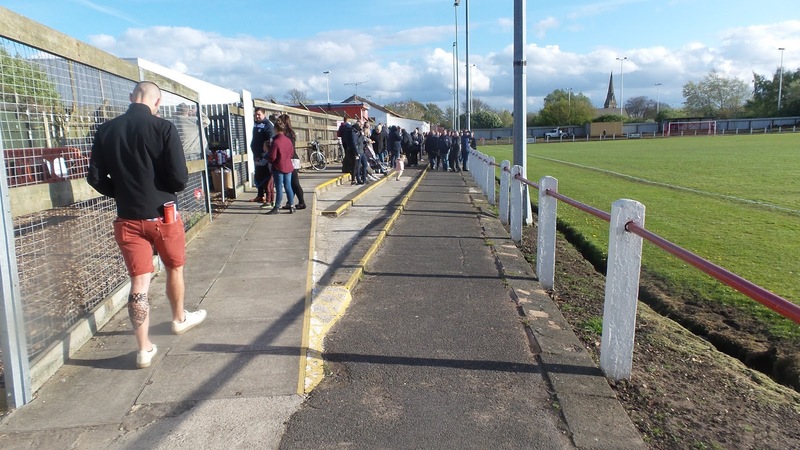 RICHARD STREET or the RIGID GROUP STADIUM as it is currently known for sponsorship purchases is a decent venue for step 6 level. 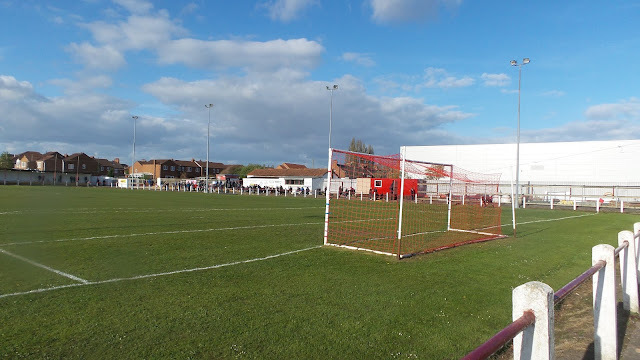 Unusually, all the cover is behind the goals, with an older main stand at one end. This is a combination of seating and standing and can probably hold around 800. There is further cover behind the other goal, a metal terrace with a capacity of around 100. 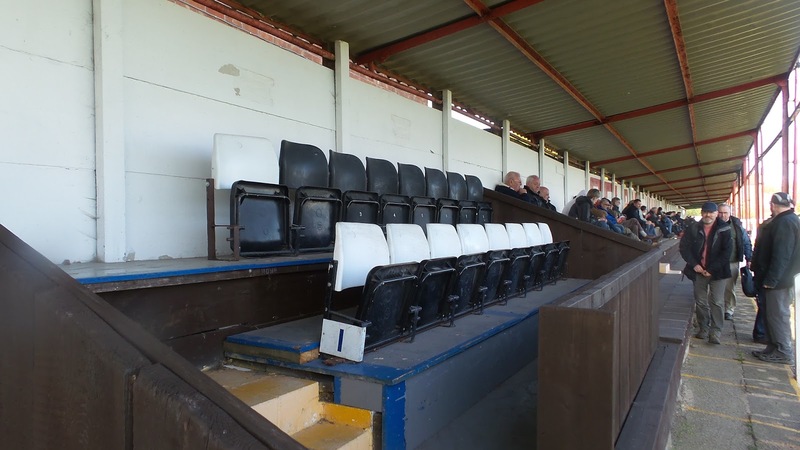 The rest of the ground is made up of open terracing with an overall capacity of 5,000. Facilities at the ground are decent, with lots of food options and a very good club shop. There is also a bar with a reasonable range, though if you prefer more choice, the town is only a 5-10 minute walk away and includes a Wetherspoons.